Last week I received a form from APNIC with a new AS numbers. When I had a look through papers I saw there something strange: AS 123456 (I replaced the original with this number). 6 digits. First I thought that there is a mistake or something, then I recall the new 4-bytes ASN. If for IPv6 the things seems to be moving slower, than for the new format of AS numbers, it seems that the things are going faster. So faster that by January 1, 2010 all BGP speaker must support this feature, according to Cisco. I didn’t understood if they refer in the document for their products or it is something that is mandatory globally. No matter how, the things are moving quite fast in this direction. Since I have to implement a BGP configuration with this 4-Bytes ASN, I started to search with Google friend about the standards and I was surprised that there is not to much to search after. Of course there is the official RFC, some other documentation, but not real examples how to configure, troubleshoot and so on. That’s why I said it’s nice to put something together for a general understanding of what is and how does it work this 4-Bytes ASN. I assume here that reader has a basic understanding of what ASN and BGP is. RFC 4893 is the reference for “BGP Support for Four-octet AS Number Space”. Currently the Autonomous System number is encoded as a two-octet (2-bytes) entity in BGP, meaning 16bits and this was defined in RFC 4271. The new system is using a four-octet (4-bytes) , meaning 32bits. Currently the ASN 2-bytes include a range from 1 – 65535, used in decimal plain text when configuring the BGP. The expansion from 2-bytes to 4-bytes give us 4,294,967,295 AS number which can be written in ASPLAIN or ASDOT format. The RIPE NCC assigns and registers 4-byte AS Numbers in ASPLAIN format. ASPLAIN defines the 4-byte AS Number as a basic 32-bit integer. OK, I hope you understand the basics of 4-bytes ASN. 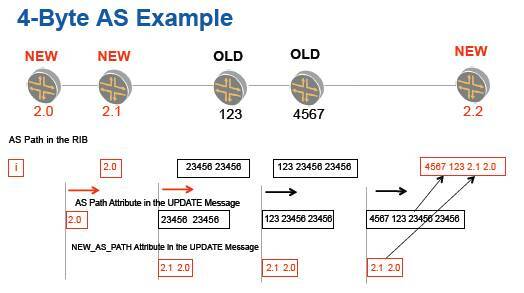 For me, some challenge was to understand to transform the 4-bytes ASN from ASPLAIN to ASDOT. In every document that I saw on the Internet there was the same example: AS 65546 in ASPLAIN is 1.10 in ASDOT, but without no explanation. See below how I understood that the conversion takes place. If I understood it wrong, please let me know, to correct it here. After all I’m not an 4-byte ASN expert, I just try to help as much as I can. So let’s take the number 65546. 1. 65546 / 65535 = 1 (integer) which will be the parte in front of the . (dot) in ASDOT representation. As a general rule, you have an ASPLAIN number. You take 65535 and see how many times it goes, with integer in the ASPLAIN number (1 time, 2 times, 3 times…depending). This will be your decimal number before dot in ASDOT format . Then you multiple the 65535 with the integer obtained in the first step and you deduct from the ASPLAIN number. From the rest after the second operation, you deduct the the decimal you have in front of the dot. The rest in decimal that comes after the dot . What confused me is that the number in the example was so close to the last 2-bytes ASN which is 65535. Now for the last example, let me take a random higher number 194534 (the example from the first line) and to obtain the ASDOT format. For some more detailed explanation I would like to ask you to download the Cisco and Juniper documents regarding 4-bytes ASN implementation in BGP. If you have any useful information about this topic or if something is wrong in my post, please comment and share your knowledge. Btw, great work on the graphical representation of the AS path. And your other post on 2-byte/4-byte was a great help too. Thanks! As good as this post is there is issue with actual calculation of ASDOT, which is the primary concern for most who look here. Follow below link or see blow info. That’s why I used 65535. It is really good. No need to calculate. But really very good efforts and really a good calculation.